The term dorsomedial nucleus of the hypothalamus refers to a group of cells located dorsal to the ventromedial nucleus of the hypothalamus and ventral to the caudal part of the paraventricular nucleus of the hypothalamus in the intermediate hypothalamic region. In the human it is not differentiated ( Saper-2012 ). In the macaque a central compact part of the dorsomedial hypothalamic nucleus can be identified ( Paxinos-2012 ). In rodents, authors distinguish two or three components, but vary in the way that they subdivide the structure. 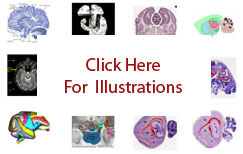 All identify a ventral part of the dorsomedial hypothalamic nucleus in both the rat ( Swanson-2004; Paxinos-2000b ) and the mouse ( Hof-2000; Franklin-2008 ). The remainder of the nucleus in rodents is divided by various authors into different combinations of the compact part of the dorsomedial hypothalamic nucleus, an anterior part of the dorsomedial hypothalamic nucleus, a posterior part of the dorsomedial hypothalamic nucleus, and a dorsal part of the dorsomedial hypothalamic nucleus. Functionally the dorsomedial nucleus of the hypothalamus belongs to the hypothalamic periventricular region of the subcortical motor system ( Swanson-2004 ).